Goldendoodles, also known as "golden poos," "goldie poos" or "groodles," are a popular dog among allergy sufferers. The breed was developed in the early 1990s, resulting in a dog that has the pleasant temperament of the golden retriever and a hair structure similar to the poodle. Grooming your goldendoodle is an important part of caring for it, and when done correctly, it can provide opportunities for bonding. Goldendoodle breeders have sorted the breed's coat types into three varieties: wavy, fleece, and curly. Each of these coat types has its own distinct characteristics. Wavy coats have a hair-like texture. They are very low maintenance, but the amount of shedding varies from dog to dog. Fleece coats, often called borderline, are made up of loose curls. They feel soft to the touch, yet are still more hair-like than wool-like. Although puppies with fleece coats require little care, the phase when the adult hair is growing in requires a great deal of care. Once the adult coats are complete, they usually stay quite soft. Some dogs with fleece coats shed more than others, but most are quite allergy friendly. 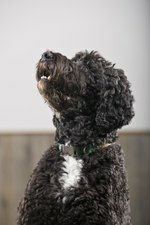 Dogs with curly coats, also called woolly coats, resemble poodles, in that they have very tight curls. When these coats are long, they require at least a half-hour of grooming per day. However, they don't shed, are very allergy-friendly, and if the hair is kept short, it's easily manageable. Goldendoodle coats come in a range of 10 colors: chalk (white), cream (gold), apricot, red, cafe, lavender, parchment, black, chocolate, and silver. A puppy born with a cafe coat may later fade to a milk chocolate color. Lavender dogs are usually born with chocolate coats which fade, so it's not until they have finished growing their adult coats that they're identified as lavender. 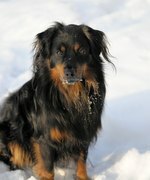 A chocolate coat is always dark, but can be sprinkled with white hairs. Grooming goldendoodles requires regular brushing and combing of the hair. If the hair isn't clipped, it will grow to between 4 and 8 inches long. The hair on the face is generally slightly shorter. Periodic maintenance grooming should be performed several times a year and includes trimming the hair around the eyes and the beard, brushing the teeth, cleaning and removing excess hair from the ears, clipping the nails and trimming hair between the foot pads, and a "sanitary trim," which consists of trimming the hair under the tail and the belly. A goldendoodle's coat should be shampooed about once a month. Always bathe a goldendoodle in a warm room. A standard bathtub or even a shower will work for bathing, although a raised tub and and a long shower hose are helpful. A nonslip mat on the floor of the tub is important. Although many manufacturers produce shampooo specifically for dogs, many of these products tend to dry out goldendoodles' skin. Instead of these, use a mild baby shampoo or a 2-in-1 shampoo with conditioner included. Regular shampoos won't kill fleas, so if this is necessary, use a shampoo designed specifically for this purpose. A human lice shampoo is also effective. When bathing a goldendoodle, start by washing the dog's face with a wet, soap-free washcloth at the head and work towards the tail. Throughout the process, avoid getting shampoo in the dog's eyes. Start lathering at the top of the head and as you go, massage the Goldendoodle's neck, back, chest, belly and legs. 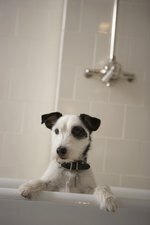 If the dog associates bathing with pleasureable experiences, it will be much easier for both the dog and the groomer. Comb through the dog's hair with a fine-toothed comb while he's lathered. Gently rinse the dog several times, starting with the head. Shampoo residue left in the hair may cause dry skin, irritation and scratching. You may towel-dry the dog to remove dripping water, but don't rub the towel against the grain of the coat, as this will cause tangles. Use a blow-dryer to finish the drying process. Start with the dryer on low so that you don't frighten the dog. While blow-drying, use a slicker brush to brush the coat. In warm weather, it's okay to let the coat air-dry, but never let a partially dried goldendoodle outside because of the risk of catching a chill. A goldendoodle's coat should never be completely shaved. The coat should be clipped to 1 1/2 to 2 inches long. Clipping with electric dog clippers is recommended if possible. However, make sure the clippers are sharp, and always bathe a dog before using electric clippers. If clippers aren't available, a sharp pair of scissors or sewing shears will work as well. Trim the dog's facial hair to resemble an upside-down "V" to maintain the characteristic goldendoodle face. Always check for mats behind the dog's elbows and ears and carefully snip these out with small, sharp scissors. Cleaning a Goldendoodle's ears is an important part of the grooming routine. Never use a cotton swab to clean the ears. Instead, mix a solution of 1 part hydrogen peroxide to 1 part white vinegar in a spray bottle and lightly spray the inside of the ears. Use a cotton ball or a washcloth wrapped around your fingertip to gently clean the ears. Dry the ears thoroughly after each cleaning.